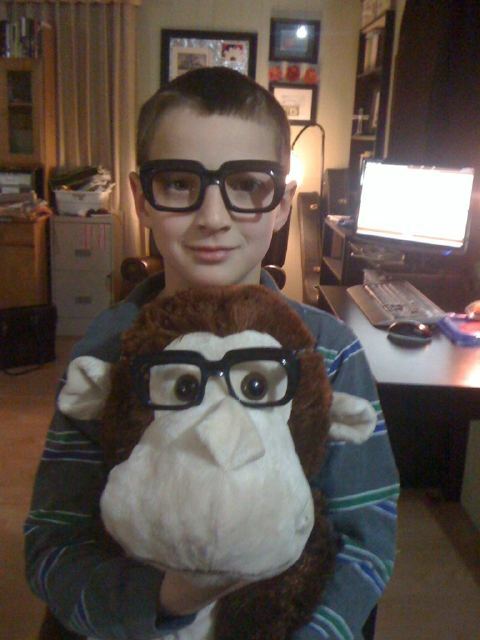 Pete is my goofy kid. He is highly entertaining! One of Benny’s favorite hashtags on Twitter is #randomcrappetesays. He loves making people laugh and he’s one of those kids that is just naturally funny. He uses a lot of big words-most of the time in the correct context, but it’s funny to hear those things come out of such a small mouth. Much to the dismay of his siblings, he also loves playing practical jokes on people. Pete is a builder. 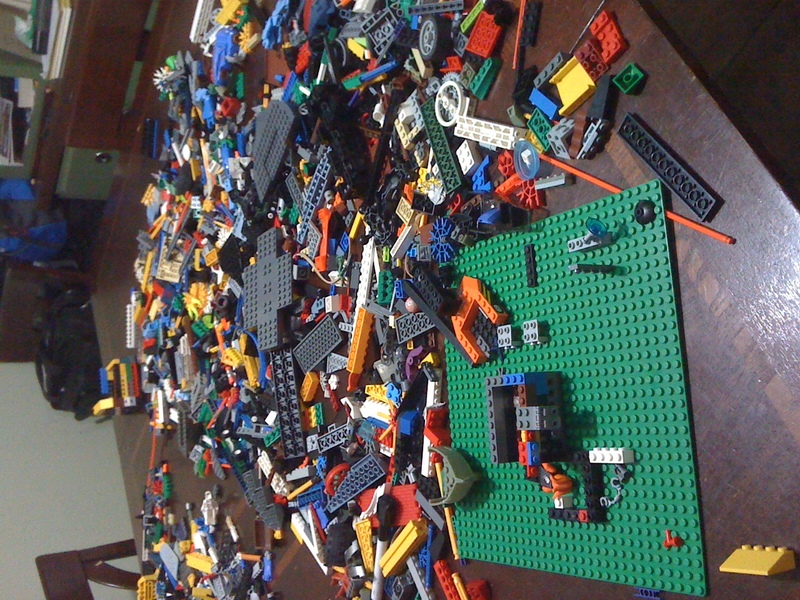 He loves to spread things out so he can get a good look at what he’s got to work with, so it was no surprise when he covered our dining room table with Legos last night and spent hours dreaming up variations of speed cruisers, water/land boats, and various flying machines. He makes all the noises that go along with building things and it gives me the giggles. He plays with such abandon. I want to be more like that. If we were a normal family –and believe me, I know we’re not – Pete would have been labeled already. I’d have teachers wanting him sedated medicated. The boy has loads of energy. A few years ago I was lectured by a woman who told me that at some point he needed to learn how to be quiet and sit still. Duh. He knows how to do that and I believe there is a time and place for it, but I also let him be him. 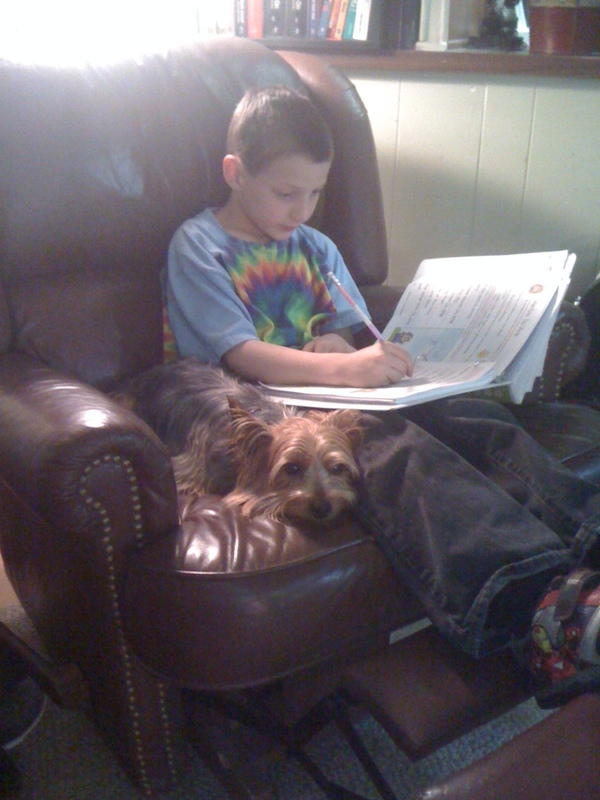 He often stands up to do his schoolwork, or does a problem then spins around in his desk chair, then does another problem. He concentrates better when he can wiggle a bit. If I notice him getting too squirrely, I have him do jumping jacks or bounce up and down for a minute. It helps. I also understand that he can sit for hours at a time if he is engrossed in what he’s doing (like his Lego time), so I’m not going to let him be labeled. I’m going to take my cues from him, then direct him accordingly. This pic (click on it to enlarge it) is proof to all who are familiar with his energy level that he can in fact sit quietly in a chair. It doesn’t happen often, but it’s possible. He can also sit still in public. 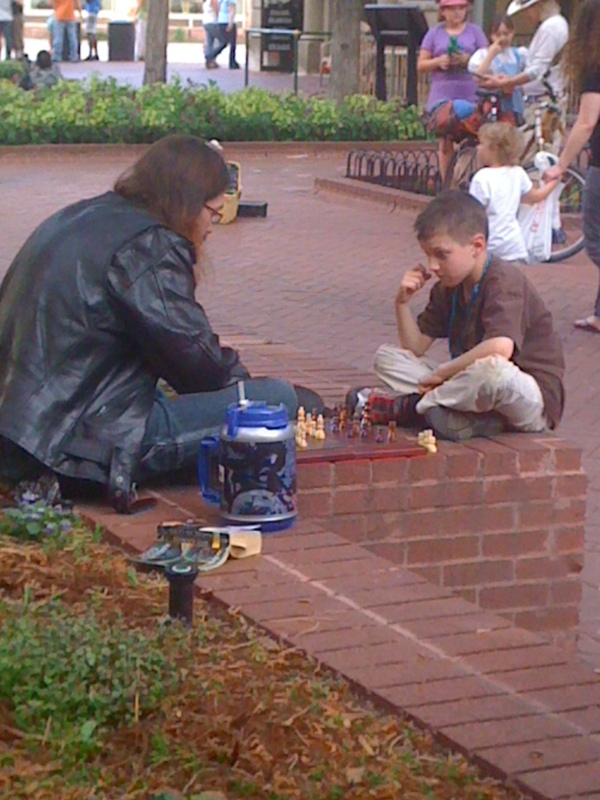 This is him playing Chess with one of our street friends on the mall. He LOVES being there with us, and he talks to everybody. He is somewhat fearless in public. For example, he took a blanket and his bongos to the Pearl Street Mall and played for over an hour hoping to make a little cash. I NEVER would have done something like that at his age. Pete sounds a lot like my son. Such a joy! I love that he plays chess with the street kids. No pretension. Just Pete. Beckie – Yes, adventure is a great word to describe it. I’m all for children using their wiggles. It helps. I think that twirling around in between math problems or spelling words is fun. That’s a great time to start them. Pete IS such a Joy! So are Max and Zoe! I am so glad I can be with them again. I really missed them. Well I missed all of you! I have a little four year old Pete in my house too. And an adventure is right! He has never met a stranger and loves to entertain anyone who will listen (and even those who don’t). If it is funny once it is funny 500 times 🙂 He keeps me on my toes and in stitches.